Serum and synovial tissue expression of the matrix metalloproteinase (MMP)-2 and -9 and their molecular regulators, MMP-14 and TIMP-2 was examined in 28 patients with inflammatory early synovitis and 4 healthy volunteers and correlated with the presence of erosions in the patients. Immunohistological staining of MMP-2, MMP-14 and TIMP-2 localized to corresponding areas in the synovial lining layer and was almost absent in normal synovium. Patients with radiographic erosions had significantly higher levels of active MMP-2 than patients with no erosions, suggesting that activated MMP-2 levels in synovial tissue may be a marker for a more aggressive synovial lesion. In cancer the gelatinases [matrix metalloproteinase (MMP)-2 and MMP-9] have been shown to be associated with tissue invasion and metastatic disease. In patients with inflammatory arthritis the gelatinases are expressed in the synovial membrane, and have been implicated in synovial tissue invasion into adjacent cartilage and bone. It is hypothesized that an imbalance between the activators and inhibitors of the gelatinases results in higher levels of activity, enhanced local proteolysis, and bone erosion. To determine whether the expression and activity levels of MMP-2 and MMP-9, and their regulators MMP-14 and tissue inhibitor of metalloproteinase (TIMP), are associated with early erosion formation in patients with synovitis of recent onset. A subset of 66 patients was selected from a larger early synovitis cohort on the basis of tissue availability for the study of synovial tissue and serum gelatinase expression. Patients with peripheral joint synovitis of less than 1 years' duration were evaluated clinically and serologically on four visits over a period of 12 months. At the initial visit, patients underwent a synovial tissue biopsy of one swollen joint, and patients had radiographic evaluation of hands and feet initially and at 1year. Serum MMP-1, MMP-2, MMP-9, MMP-14, and TIMP-1 and TIMP-2 levels were determined, and synovial tissue was examined by immunohistology for the expression of MMP-2 and MMP-9, and their molecular regulators. Gelatinolytic activity for MMP-2 and MMP-9 was quantified using a sensitive, tissue-based gel zymography technique. Four healthy individuals underwent closed synovial biopsy and their synovial tissues were similarly analyzed. Of the 66 patients studied, 45 fulfilled American College of Rheumatology criteria for rheumatoid arthritis (RA), with 32 (71%) being rheumatoid factor positive. Of the 21 non-RA patients, seven had a spondylarthropathy and 14 had undifferentiated arthritis. Radiographically, 12 of the RA patients had erosions at multiple sites by 1 year, whereas none of the non-RA patients had developed erosive disease of this extent. In the tissue, latent MMP-2 was widely expressed in the synovial lining layer and in areas of stromal proliferation in the sublining layer and stroma, whereas MMP-9 was expressed more sparsely and focally. MMP-14, TIMP-2, and MMP-2 were all detected in similar areas of the lining layer on consecutive histologic sections. Tissue expression of MMP-14, the activator for pro-MMP-2, was significantly higher in RA than in non-RA patients (8.4 ± 5 versus 3.7 ± 4 cells/high-power field; P = 0.009). In contrast, the expression of TIMP-2, an inhibitor of MMP-2, was lower in the RA than in the non-RA samples (25 ± 12 versus 39 ± 9 cells/high-power field; P = 0.01). Synovial tissue expressions of MMP-2, MMP-14, and TIMP-2 were virtually undetectable in normal synovial tissue samples. The synovial tissue samples of patients with erosive disease had significantly higher levels of active MMP-2 than did those of patients without erosions (Fig. 1). Tissue expression of MMP-2 and MMP-9, however, did not correlate with the serum levels of these enzymes. With the exception of serum MMP-2, which was not elevated over normal, serum levels of all of the other MMPs and TIMPs were elevated to varying degrees, and were not predictive of erosive disease. Interestingly, MMP-1 and C-reactive protein, both of which were associated with the presence of erosions, were positively correlated with each other (r = 0.42; P < 0.001). 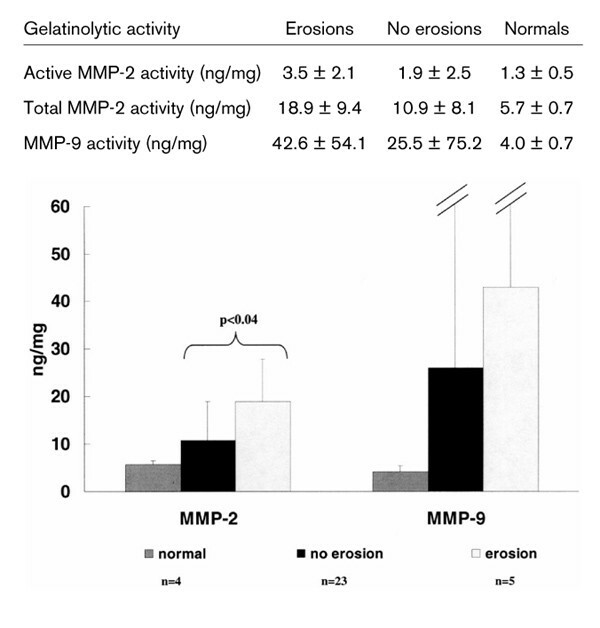 Matrix metalloproteinase (MMP)-2 and MMP-9 gelatinolytic activity in patients with erosions, in patients with no erosions, and in normal control individuals. MMP-2 and MMP-9 are thought to play an important role in the evolution of joint erosions in patients with an inflammatory arthritis. Most studies have concentrated on the contribution of MMP-9 to the synovitis, because synovial fluid and serum MMP-9 levels are markedly increased in inflammatory arthropathies. Previously reported serum levels of MMP-9 have varied widely. In the present sample of patients with synovitis of recent onset, serum MMP-9 levels were elevated in only 21%. Moreover, these elevations were not specific for RA, the tissue expression of MMP-9 was focal, and the levels of MMP-9 activity were not well correlated with early erosions. Although serum MMP-2 levels were not of prognostic value, high synovial tissue levels of MMP-2 activity were significantly correlated with the presence of early erosions. This may reflect augmented activation of MMP-2 by the relatively high levels of MMP-14 and low levels of TIMP-2 seen in these tissues. We were able to localize the components of this trimolecular complex to the synovial lining layer in consecutive tissue sections, a finding that is consistent with their colocalization. In conclusion, we have provided evidence that active MMP-2 complexes are detectable in the inflamed RA synovium and may be involved in the development of early bony erosions. These results suggest that strategies to inhibit the activation of MMP-2 may have the potential for retarding or preventing early erosions in patients with inflammatory arthritis. Radiographic erosions are characteristic of a number of chronic inflammatory arthropathies, and are associated with articular destruction leading to functional loss and disability [1,2]. The prevention or retardation of erosions is a major objective for early therapeutic interventions in patients with new onset arthritis . Although the pathologic processes that underlie the development of erosions are incompletely understood, a considerable body of evidence has suggested that a pannus of cells that originate in chronically inflamed, proliferative synovial tissue becomes locally invasive, and enzymatically degrades the matrix of the articular cartilage and periarticular bone . Although a number of enzymes have been shown to be involved in erosion formation, several members of the matrix metalloproteinase (MMP) family are thought to play a central role in the degradation of the extracellular matrix of articular bone and cartilage. Of the MMPs, the collagenases [5,6] and stromelysins  have been the best studied, and marked elevations in serum and synovial levels have been found in rheumatoid arthritis (RA) . A number of studies have shown that the serum and synovial levels of both gelatinases MMP-2 [9,10] and MMP-9 [11,12,13] are similarly elevated in RA. Although both of these MMPs are expressed at the junction between synovial pannus and cartilage or bone , further evidence of their direct role in erosion formation is lacking. In addition members of this subfamily of MMPs are involved in the invasiveness of cancers [15,16], and thus may also play a similar role in the invasion of synovial pannus. The regulation of MMP activity is complex, and occurs at multiple levels [17,18,19]. In most cases, MMPs are secreted as proenzymes and then undergo extracellular activation. Few studies have evaluated the levels of active MMPs in situ. Gel zymography has proved to be a sensitive and effective method of detecting the activity of gelatinases in small tissue samples . In the present study we evaluated the levels of active MMP-2 and MMP-9 in small synovial biopsy samples obtained from patients with synovitis of recent onset. We also examined the synovial expression of the gelatinases by immunohistology, as well as their serum levels in order to determine whether these indices may predict erosions in RA patients. A total of 66 patients that formed a subset of a larger early synovitis cohort, recruited into an ongoing US National Institutes of Health protocol (94-AR-0194), were selected for analysis on the basis of having stored optimum cooling temperature (OCT) compound samples available for analysis. The patients had peripheral joint synovitis with duration longer than 6 weeks but less than 12 months. After the initial evaluation they were followed prospectively for 12 months. Of those patients, 45 fulfilled the American College of Rheumatology criteria for RA , seven patients fulfilled the European Spondylarthropathy Study Group criteria for spondylarthropathies , and 14 could not be classified and were diagnosed with undifferentiated arthritis. Serum aliquots obtained at the initial visit were used for the analysis of serum MMP and tissue inhibitor of metalloproteinase (TIMP) levels. All patients underwent a closed needle biopsy of synovial tissue  from an inflamed joint, typically a knee. Tender and swollen joint counts were obtained from 66 joint areas; hips were excluded. Anterioposterior and lateral radiographs of the hands and feet were obtained at the initial visit and at 1-year follow-up visit. Radiographs were read by experienced radiologists, who were unaware of the patient's diagnosis or test results, and were scored for erosions. Erosions were defined as unequivocal loss of cortical and subcortical bone in at least two different joints of either the hands or feet. Of the 66 patients who underwent a clinical evaluation and analysis of serum MMP levels, 28 had synovial tissue biopsies with detectable lining layer and large enough samples to determine MMP and TIMP expression by gel zymography and immunohistochemistry. Healthy volunteers (n = 4) were recruited under the same protocol and a synovial knee biopsy was performed once signed informed consent was obtained. These tissues were also assayed by gel zymography and stained immunohistochemically. Antibodies to MMP-2 (immunoglobulin G1), MMP-9 (immunoglobulin G1) and MMP-14 (immunoglobulin G1) were purchased from Research Diagnostics Inc (Flanders, NJ, USA). The TIMP-2 (immunoglobulin G1) antibody was obtained from Calbiochem (La Jolla, CA, USA). Polyclonalmouse immunoglobulin G1 was used as negative controlin the staining experiments. Enzyme-linked immunosorbent assay (ELISA) kits for serum MMP-1, TIMP-1 and TIMP-2, and the activity assays for MMP-2 and MMP-9 were purchased from Biotrak (Amersham Pharmacia Biotech, Piscataway, NJ, USA). Precast zymography gels containing 10% Tris glycine with 0.1% gelatin as substrate were purchased from Novex (San Diego, CA, USA), and protein quantification kits were purchased from Bio-Rad Laboratories (Hercules, CA, USA). ELISA assays for MMP-1, TIMP-1, and TIMP-2 were performed according to the manufacturer's instructions. Briefly, 100 μ l diluted serum samples were pipetted in duplicates into the appropriate ELISA microtiter wells and incubated for 2 h at 20-25 °C. Wells were washed and incubated with 100 μl of the antiserum for 2 h at 20-25°C, and incubated with 100 μl of the peroxidase conjugate for 1h. After washing 100 μl of 3,3',5,5' -tetramethylbenzi-dine/hydrogen peroxide substrate were pipetted into the wells and incubated for 30 min at room temperature. Absorbance at 630 nm was measured spectrophotometrically in an automated plate reader. Active and total MMP-2 and MMP-9 were measured by activity assays. Assays were performed according to the manufacturer's instructions. Briefly, 100 μl diluted serum samples were plated in quadruplicate and refrigerated at 4 °C overnight. Plates were washed in an automated plate washer and 50 μl of a 1mol/l p-aminophenylmercuric acetate, which activates pro-MMP, was added only into duplicate wells in which total MMP activity was to be measured. After 2 h of incubation at 37 °C, 50 μl detection reagent containing a modified urokinase and S-2444 peptide substrate was added to all wells. Plates were read spectrophotometrically at time 0 and after a 2-h incubation at 37 ºC for 2 h at an absorbance of 410 nm. MMP activity was represented by the change of absorbance over time. These values were compared with a standard curve of serial dilutions of a known concentration of activated enzyme. Normal range of values was provided by the manufacturer. Gel zymography on synovial tissue samples was performed according to a protocol developed by Kleiner et al . Unfixed cryosections of synovial tissue, obtained from closed needle biopsies as described above, were scraped off the slide with a 22-gauge needle, transferred into a microfuge tube, and vortexed. Media from a HT-1080 fibrosarcoma cell line was used as a positive control for MMP-2 and MMP-9 activity. Of each sample suspension, 30 μl were loaded onto a precast sodium dodecylsulfate- polyacrylamide gel electrophoresis (SDS-PAGE) containing 0.1% gelatin. After electrophoresis, gels were washed in 2.5% Triton X for 3 h and incubated at 37 °C in low salt collagenase buffer containing 50 mmol/l Tris, 0.2mol/l NaCl, 5mmol/l anhydrous CaCl2, and 0.02% Brijdetergent. The gels were subsequently stained with 0.5% Comassie blue (G-250), destained with 30% methanol and 10% acetic acid, and incubated in 30% methanol and 5% glycerol. They were dried between cellophane sheets. Areas of gelatinase activity appeared as nonstaining bands on the gels. The zymography gels were scanned and analyzed using US National Institutes of Health Image 1.6 software. Integrated pixel density for each gelatinolytic band was recorded and reported in volume units of pixel intensity × mm2. Each value was normalized against the protein concentration, determined by a protein quantitation kit according to the manufacturer's instructions, and reported as gelatinase activity in nanograms per milligrams of protein. Gelatinolytic bands at 92, 72, and 62 kDA represent latent MMP-2, latent MMP-9, and active MMP-2 activity, respectively. 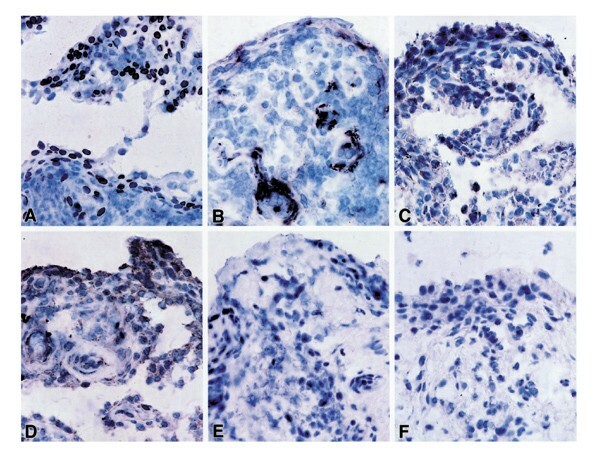 Immunohistochemistry was performed according to standard techniques . OCT-embedded synovial tissue was cryosectioned into 8-μm thick sections and acetone fixed on glass slides. After hydration and blocking of endogenous peroxidase activity, tissues were blocked with a dilution of human and goat serum. Sections were incubated with primary antibody at the following concentrations: MMP-2 (1 : 75), MMP-9 (1 : 75), TIMP-2 (1 : 75), and MMP-14 (1 : 30). Negative controls using either mouse immunoglobulin G1antibodies or no primary antibody were performed with each experiment. Slides were washed and incubated with goat antimouse biotinylated antibody at a 1 : 750 dilution followed by incubation with streptavidine horseradish peroxidase. Slides were developed with a substrate chromogen solution until a brown reaction product was observed, then counterstained with hematoxylin and coverslipped. Synovial tissues suitable for analysis were histologically evaluated for the presence and degree of inflammation. All tissues were analyzed in a blinded manner by two independent observers. Proliferation of the lining layer, inflammatory cellular infiltration of the sublining layer, lymphocytic aggregates, and stromal proliferation were scored semiquantitatively from 0 to 3 in five high-power fields (HPFs; 400 ×) for each category. Scores were added and divided by four to derive a tissue composite index. Tissue scores for MMP expression were obtained by counting the number of positive cells in the lining layer and sublining layer (one HPF underneath the lining layer) in five representative HPFs (400×) and expressed as positive cells/HPF. Differences between patient groups were analyzed using χ2, analysis of variance, and Kruskal-Wallis tests. The clinical features of the 66 patients studied are shown in Table 1. Patients with RA were older, had more tender and swollen joints, were rheumatoid factor positive, and were more likely to be on disease-modifying antirheumatic drug therapy than were non-RA patients. Of the patients with RA, 12 had erosions at multiple sites by 1 year, whereas none of the non-RA patients had developed definite erosions. Patient characteristics in the subset of 28 patients who underwent synovial tissue immunohistology and gel zymography did not differ significantly from the larger sample (data not shown). Comparisons were made between groups. Values are presented either as means ± standard deviation or as total numbers (%).CRP,C-reactive protein; DMARD, disease-modifying antirheumatic drug; ESR, erythrocyte sedimentation rate; RA, rheumatoid arthritis; RF = Rheumatoid factor. MMP-1 serum concentrations in all 66 (100%) patients examined were elevated, as were total MMP-9 levels in 14 (21%), TIMP-1 levels in 65 (98%), and TIMP-2 levels in 14 (21%) patients (Table 2). Serum levels were not elevated over the normal range provided by the manufacturer. Patients with erosive disease had higher serum MMP-1 and mean C-reactive protein (CRP) levels than patients without erosion (P < 0.01). levels of mmp-1, but not of other mmps, significantly correlated with the crp levels (> r = 0.42; P < 0.001). overall serum mmp-2 and mmp-9 levels did not correlate with tissue expression of these enzymes (data not shown). Values are expressed as mean ± standard deviation of serum matrix metalloproteinase (MMP) levels measured in 66 patients. Comparison groups were divided into rheumatoid arthritis (RA) and non-RA patients, and subsequently into patients with erosive and nonerosive disease. Erosions were defined as definite erosions in more than one joint (see Patients and method). †Normal values provided by the manufacturer of the ELISA kit. Normal values were not available for the assays for active MMP-2 and MMP-9. *P <0.01. crp, c-reactive protein; timp, tissue inhibitor of metalloproteinase. Expressions of MMP-2, MMP-9, MMP-14, and TIMP-2 in representative locations in the synovial tissue specimens are shown in Figure 2. Of note, the antibodies used to detect MMP-2 recognized only the latent zymogen form. MMP-2 was widely expressed in the synovial lining layer and in areas of stromal proliferation in the sublining and stromal layer. MMP-9 expression was more focal and was observed sparsely in the lining layer and in the endothelium of single vessels in both RA and non-RA tissues. MMP-14 and TIMP-2 were detected primarily in the lining layer on consecutive tissue sections. Matrix metalloproteinase (MMP)-2, MMP-9, MMP-14 and tissue inhibitor of metalloproteinase (TIMP)-2 expression in synovial tissue. (a) MMP-2 expression; (b) MMP-9 staining; (c) MMP-14 expression; (d) TIMP-2 expression; (e) no primary antibody; (f) mouse immunoglobulin G1(isotype control). MMP expression was assayed in 21 RA tissues and seven non-RA tissues, and results were compared among groups and with tissues from four healthy volunteers without evidence of an arthropathy or traumatic injury (Table 3). Tissue composite indices of inflammation were similar in the RA and non-RA tissues. Five of the 21 RA patients had erosions at multiple sites, as compared with none of the non-RA patients. Synovial tissue expressions of MMP-2, MMP-14, and TIMP-2 were virtually undetectable in all normal volunteers; MMP-9 expression was observed in an isolated area of one normal synovial tissue sample. Tissue expression for MMP-14, the activator for pro-MMP-2, was significantly higher in RA than in non-RA patients (8.4 ± 5 versus 3.7 ± 4 cells/HPF; P = 0.009). In contrast, the expression of TIMP-2, an inhibitor of MMP-2, was lower in the RA than in the non-RA samples (25 ± 12 versus 39 ± 9 cells/HPF; P = 0.01). Activated and latent MMP-2 activities, as measured by gel zymography, tended to be higher overall in the RA patients than in the non-RA patients, but results were not statistically different. For definition of 'composite index', refer to the Patients and method section. *P < 0.05, **P < 0.01, versus nonrheumatoid arthritis (ra) patients; †P < 0.05, ‡ P < 0.01, versus normal volunteers. mmp, matrix metalloproteinase; timp, tissue inhibitor of metalloproteinase. The results of synovial tissue MMP-2 and MMP-9 expressions were compared among patients with erosive disease, patients without erosions, and normal volunteers (Fig. 1). Patients with erosive disease had significantly higher synovial levels of total MMP-2 (10.9 ± 8.1 versus 18.9 ± 9.4 ng/mg; P = 0.04) and active MMP-2 (3.5 ± 2.1 versus 1.9 ± 2.5 ng/mg; P = 0.04) than patients without erosions. Similarly, mean MMP-9 activity was higher in tissue samples from patients with erosive disease, but wide variations in tissue expression resulted in poor discrimination between groups. As expected, synovium of normal volunteers had significantly lower MMP-2 activity than that of the patients (5.7 ± 0.7 versus 12.3 ± 8.7 ng/mg; P < 0.05). this trend was also observed for mmp-9, but did not reach statistical significance, probably due to the very wide standard deviation (4.0 ± 1.3 versus 28.6 ± 71.2 ng/mg in normal individuals and in the patients, respectively; > P = 0.07). Joint destruction is one of the hallmarks of erosive arthropathies and leads to significant morbidity and disability. Newer imaging studies have concluded that erosion formation can occur very early in the disease . Detailed pathologic studies, although generally performed on destroyed joints obtained at the time of arthroplasty, have suggested that these erosions result from direct invasion of synovial tissue into the adjacent articular bone and cartilage. It has been postulated that the locally invasive cells that form the aggressive pannus have acquired a transformed phenotype, and analogies to invasive cancer cells have been made . Several metalloproteinases that are capable of the proteolytic degradation of extracellular matrix are thought to play a major role in the dissolution of the bone and cartilage matrix, allowing the invasive cells to migrate into the stroma across cell boundaries. Although the relative contribution of each MMP to this process remains unclear, the gelatinases, particularly MMP-2, appear to play a prominent role in tissue invasion . In patients with arthritis, most studies have concentrated on the contribution of MMP-9 to the underlying mechanism of joint destruction. In contrast to MMP-2, MMP-9 levels tend to be higher in inflammatory arthropathies than in traumatic, osteoarthritic, and tissue repair processes [11,12,27]. Furthermore, these two MMPs differ in tissue distribution and transcriptional regulation. These observations suggest that MMP-2 and MMP-9 may contribute differentially to the pathophysiologic processes that lead to joint destruction. In the joint, MMP-9 is expressed in macrophages in the synovial lining layer, in vascular endothelial cells, leukocytes, chondrocytes, and osteoclasts. It is also expressed on cultured fibroblasts and on activated fibroblasts in vivo [11,28]. MMP-9 is inducible by inflammatory cytokines such as tumor necrosis factor-α and interleukin-1 [19,29], and the post-transcriptional regulation in vivo remains incompletely understood. MMP-9 is secreted in an inactive zymogen form and can be activated in vitro by the plasmin cascade and through other MMPs [30,31,32,33]. In its inactive form MMP-9 is complexed to TIMP-1 . The regulation of MMPs by inflammatory cytokines, and the expression of MMP-9 in macrophages and vascular structures have previously suggested that MMP-9 may be associated with the synovial inflammation and neovascularization [35,36]. In contrast to MMP-9, MMP-2, in the inactive zymogen form, is constitutively expressed by many cell types, including fibroblasts and endothelial cells, and is involved in many aspects of normal tissue remodeling and angiogenesis [37,38]. Its unique regulatory requirements at the cell surface have suggested a special role for MMP-2 in tissue invasion. The transcriptional and post-translational activation of this enzyme is tightly regulated . MMP-2 differs from several other members of the metalloproteinase family in that its transcription is not induced in response to the proinflammatory cytokines tumor necrosis factor-α and interleukin-1, and seems primarily regulated post-translationally. As is characteristic of most of the MMPs, MMP-2 is produced as a proenzyme, and requires activation by enzymatic cleavage. Evidence from several investigators has suggested that MMP-2 in its active form is bound in a trimolecular complex at the cell surface [39,40,41,42]. Pro-MMP-2 complexed with TIMP-2 binds to a TIMP-2 binding site on the membrane-bound MMP-14 receptor, and through a conformational change the catalytic domain becomes exposed forming the active enzyme complex. Upon dissociation from the MMP-14 receptor, TIMP-2 binds the catalytic site and suppresses the activity. Thus, the activity of MMP-2 is regulated locally by a delicate balance between MMP-14 activation and TIMP-2 inhibition. Studies have localized this trimolecular complex to the invadopodia of malignant cells at sites of tissue invasion into stroma [43,44] and serum levels and high tissue expression levels of active MMP-2 are predictors of disease severity and shortened survival in several malignancies [15,16]. In view of the analogies between erosion formation in arthritis and tumor invasion in cancer, we hypothesized that activated MMP-2 and possibly MMP-9 might play an important role in the early stages of invasion of synovial pannus into bone and cartilage. Synovial tissue specimens obtained from a cohort of patients with early synovitis were examined for the presence of MMP-9 and components of the MMP-2-associated trimolecular complex. A highly sensitive zymographic technique was used to evaluate tissue levels of active and latent MMP-2. Our immunohistologic data suggest that MMP-2, TIMP-2, and MMP-14 are all localized to the synovial lining layer. Previous reports have found colocalization of these molecules in areas of tissue remodeling, loosening of prosthetic joints [45,46,47], and in the cartilage-pannus junction . Although the results of these experiments do not prove that the expression of these molecules occurs on the same cell, they are consistent with the view that the synovial lining layer is a site of MMP-2 activation. Because of the blind nature of the biopsy technique used in the present study, we did not specifically sample areas of synovium directly adjacent to cartilage and bone. We did, however, ensure that all of the needle biopsy samples examined immunohistologically and zymographically had clear evidence of a well-defined synovial lining layer, were of adequate size, and were thus appropriate for comparative evaluation. The selection of biopsy material with detectable lining layer and sufficiently large size for analysis may have biased our results toward patients with more proliferative synovial lesions, and possibly more severe disease. This selection bias would have occurred in the RA and non-RA patients, however, and is therefore unlikely to account for the differences seen in MMP-2 activity between the patient groups. We compared the synovium of patients with early RA with that of patients with other forms of early synovitis, and with that of normal volunteers. The RA samples tended to have the highest expression levels of MMP-2 and MMP-14, but they exhibited low levels of TIMP-2 expression. More importantly, we showed that the patients with radiographic erosions, all of whom had RA, had the highest levels of active MMP-2 by gel zymography. We therefore propose that the augmented levels of activated MMP-2 detected in the synovia of patients with early erosive RA may relate, at least in part, to an imbalance between activation by MMP-14 and inhibition by TIMP-2. Immunohistologically, MMP-9 expression was clearly higher in inflamed synovium than in normal synovium, where it was virtually undetectable. Furthermore, MMP-9 activity levels tended to be higher in the synovial samples of patients with radiographic erosions than those of patients without erosions, but the measured values varied widely in the specimens examined. The focal expression of MMP-9 in these synovial tissues, combined with the small number of samples examined, might have contributed to the wide tissue variations observed. Overall, the present observations suggest an association between the presence of active synovial gelatinases and the early development of erosive articular damage. Although the evidence is indirect, these data are consistent with the hypothesis that high levels of activated synovial gelatinases reflect augmented synovial invasiveness; these observations are similar to those made in the context of invasive cancers . Although there continues to be controversy regarding the origins of the invasive cells at the junction of cartilage/bone and pannus, considerable evidence has accumulated that the lining cells in RA synovium exhibit a 'transformed' phenotype that is typical of invasive cells [26,48]. We attempted to evaluate the more readily available serum levels of active MMPs as predictors of joint erosions. Overall, only the serum levels of MMP-1 were significantly associated with erosions and with CRP levels. Persistent CRP elevation in RA patients has been shown to be associated with the progression of radiographic erosions , but a previous RA study failed to associate MMP-1 levels with erosions . In general, serum levels of MMPs have tended to vary widely in the reported studies [9,11,12,51], and appear not to be of prognostic value. Furthermore, degranulation of platelets and neutrophils may contribute to the elevation of serum levels of MMP-2 and MMP-9 seen in the patients, and may be an explanation for the high baseline level in the serum [52,53]. In contrast, this is not the case for MMP-1, because no blood cell carries a preformed secretory granule of this enzyme and this may explain why MMP-1 levels relate more closely to radiographic erosions. The measurement of serum MMP levels in the context of controlled therapy trials has not been well explored. In the present study we provided evidence that active MMP-2 complexes are expressed in the synovium and may be involved in the development of bony erosions. Therapeutic strategies to inhibit a broad spectrum of MMPs, including MMP-2 and possibly MMP-9, may therefore present a more powerful approach to retard or prevent early erosions in patients with an inflammatory arthropathy.